There are number of cleaning and organizational projects that you can do to keep your laundry room both functioning well and spotless. 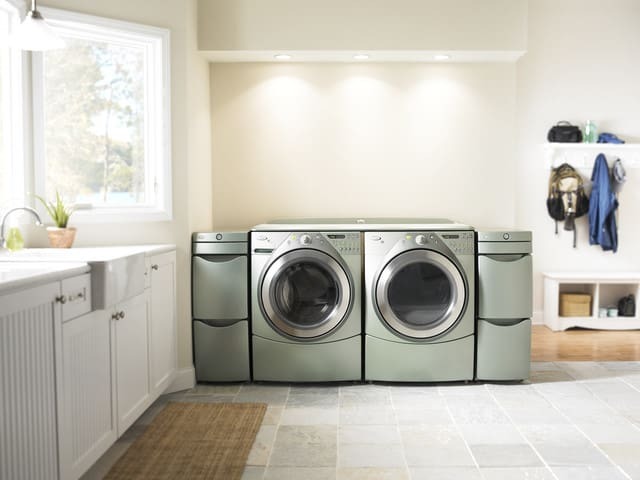 Here are a few tips that can make your laundry room look great day in and day out. **Install an out-of-the-way drying bar ** Whether you’re drying cotton button downs, stockings or blouses that you don’t want to place in your dryer, a drying bar can come in handy. Many people use folding drying racks for hanging a few damp shirts, but as these aren’t actually space savers. Although many racks can be folded up and put out of sight, they can’t hold as much clothing as a drying bar. The smartest solution is to mount a bar below a wall shelf to take up unused space and provide drying room for all of best clothing. **Find space for all of your cleaning supplies ** One of the most constant sources of clutter for any laundry room are the many detergents, softeners and dryer sheets that can spill and leak. Although washers and dryers typically have defined spaces in laundry rooms, many aren’t built with organized storage for cleaning supplies. Use carry-all caddies and baskets to hold supplies. You’ll be able to contain the mess in these boxes and even add a touch of style to the space by choosing containers with fabric or decorative designs. Caddies work well for wire shelving in particular because they help prevent spillage from detergent containers. It doesn’t take much time to get your laundry room, clean and tidy. Wash out washers and dryers to avoid any mold and mildew build up. Before cleaning any machine it’s a good idea to talk to the manufacturer for advice. But, we recommend running an empty washer with a cup of white vinegar. This will clean and sanitize the interior. Similarly, people may want to take a rag with soap and water to their dryer drum to eliminate any residue. Other more basic cleaning, like mopping, sweeping and dusting, can also create a healthy, organized laundry atmosphere. Especially because many people leave the laundry area out of their frequent cleaning schedule. **Keep moisture at bay ** Because laundry rooms deal with heat and steam, either in the dryer or steam washers, you’re liable to get mildew or water damage. These issues don’t even necessarily present a cleanliness issue so much as a health concern. The Environmental Protection Agency said that mildew and other moisture-related growths can be tied to asthma, allergies and other illnesses. If you find yourself with a mold or fungus growth in your laundry room, it’s important to act fast. The EPA told homeowners to first check for the source of the moisture. This can be anything from a dripping pipe, a leaking machine or a vent with a hole in it. When an area is found to be wet, the EPA advised that people dry and monitor it for the next 48 hours to ensure it stays dry and mold doesn’t begin to grow. On hard surfaces like concrete water damage and mold can often be cleaned and eliminated. With dry wall, wood, carpeting and other materials sometimes the best solution may be to replace the area. **Organize your power use ** Your washer and dryer use some of the most power in your home. The energy usage of these machines should be one of the most important factors when buying a new unit. Energy Star certified options can help you and your family go green as well as make a noticeable impact on your energy bill. **Give everything a place ** The quickest way to let things get messy and out of hand, is to not have defined spaces for everything in your laundry room. Of course your cleaning supplies and machines have a place, but you need to have a space for dirty laundry, folded towels and anything else you may want to store in the convenient space. These tips can help you turn your laundry room into an organized, efficient and clean workspace to help your do your laundry comfortably.